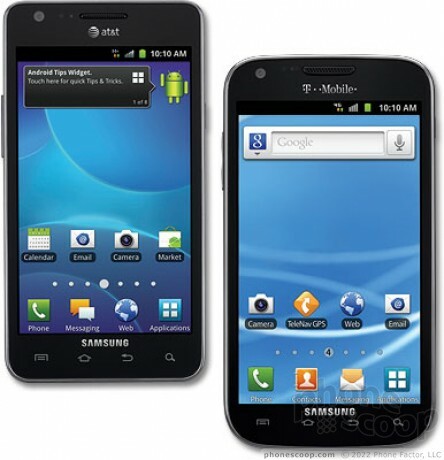 AT&T and T-Mobile today announced that they will both be getting versions of the Samsung Galaxy S II. Confusingly, they will both bear the name "Galaxy S II", but will have different specs, including different screen sizes. The T-Mobile version will have a 4.52-inch display, like the Sprint Epic 4G Touch, while the AT&T version will have a 4.3-inch display (though both will use Samsung's Super AMOLED Plus display technology.) The AT&T version will also sport a 1.2-GHz dual-core processor, 16 GB of internal memory, 8-megapixel main camera with 1080p video capture, 2-megapixel front camera, and HDMI output. All new Galaxy S II phones also include extensive support for enterprise systems such as Exchange ActiveSync 14, Cisco VPN, and Sybase MDM. AT&T claims its models will be the thinnest, at 8.89mm. T-Mobile released little information on its model, although Samsung is releasing more information tonight (see our hands-on article.) Neither carrier revealed a release date, although Samsung is citing a "fall" release. Phone Scoop looks at the Galaxy S II smartphone for AT&T's network. While this version packs a smaller screen than its larger brothers, there are some surprising benefits. Samsung and T-Mobile USA today announced that they will offer a white version of the Samsung Galaxy S II smartphone "in time for the holidays." Exact pricing and launch details were not provided, though Samsung said more information will become available in the coming weeks. ok, 16gb is a lot of room when you take into account the SD card slot but i was ready to upgrade if the 32gb model rolled into AT&T .. 64gb of available memory? now that would have been amazing. SanDisk just released their 64GB MicroSD Cards. Only two-hundred bucks(lol)! Its between the IPhone 5, Thrill and GSII. Lets see what the Iphone 5 has to offer. gota have the iphone 5, need more GBs, 5G, i5 processor. If their best, needs to have LTE to compete with Iphone 5 and LG.